Our expert team of garage door specialists have been serving Mercer County Pennsylvania for decades. As a proud member of the Overhead Door's exclusive network of Overhead Door Red Ribbon Distributors, we hold ourselves to the highest standards of excellence - providing quality products and dedicated service to homes and businesses in the local area. 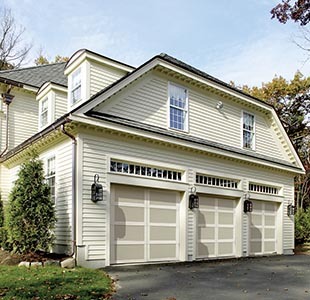 Your garage door is an important part of your home or building and a system you rely on. Rely on us to make sure it’s installed correctly and functioning at optimal safety and efficiency. We provide world-class service on virtually every make or model of door and opener. You can expect a uniformed professional with the knowledge to make a sound diagnosis and repair. Need help repairing broken garage door springs? We offer an on-call 24-hour emergency service for all of those unexpected breakdowns or accidents. Call for rates. Area You in our Service Area? If you live in Western Pennsylvania, this answer is most likely yes. With one location in Erie and one in Franklin, we are able to provide elite garage door repair and installation services to a large service area. If you live near Erie or Frankling, including towns like Meadville, Clarion, Grove City, Hermitage, Greenville, and Mercer, call us to find out how we can help take care of all of your garage door service and installation needs.